Örnekler, matematik öğretiminde kullanılan önemli araçlardan biridir. Ancak yapılan araştırmalar incelendiğinde, matematik öğretmen adaylarının, farklı türdeki matematiksel örnekleri nasıl algıladığı, öğretmen ve öğrenci tarafından verilen örneklerin hangi amaçlara hizmet ettiğine dair bir araştırmaya rastlanmamıştır. Öğretmen adaylarının matematiksel örnekleri algılayış biçimleri, ilerideki mesleki hayatlarında matematiksel örnekleri nasıl kullanacakları hakkında fikir verebilir. Bu nedenle bu çalışmanın amacı, matematik öğretmen adaylarının farklı tür matematiksel örnekler ile öğretmen ve öğrenci tarafından verilen örnekleri nasıl algıladıklarını metafor analizi ile incelemektir. Çalışmanın katılımcılarını 190 matematik öğretmen adayı oluşturmaktadır. Veri toplama aracında katılımcılardan; “Görsel örnek …….. gibidir, çünkü ……” ; “Cebirsel örnek …… gibidir, çünkü ……” ; “Öğretmenin verdiği örnek gibidir, çünkü ……” ; “Öğrencinin verdiği örnek .…. gibidir, çünkü ……” ifadelerini tamamlamaları istenmiş ve elde edilen veriler içerik analizine tabi tutulmuştur. Çalışmadan elde edilen verilerin güvenirliğini sağlamak amacıyla 11 katılımcı ile yarı yapılandırılmış görüşme yapılmıştır. Ayrıca görüşmeler yoluyla öğretmen adaylarının örnekleri algılayış biçimlerine ilişkin derinlemesine veri elde edilmiştir. Examples are one of the important tools used in mathematics teaching. However, when these researches were examined, there isn’t any research which grasps how preservice teachers perceive the mathematical examples or what they think about the purpose of examples which were given by teachers or students. Conception of examples of preservice teacher can give clues about the use of examples in their future profession. To reveal the opinions of preservice teachers whether examples can be generated by students, is important to ensure that teacher training programs place emphasize on this issue. So, the purpose of the study is to investigate the preservice teachers’ conception of different kinds of mathematical examples and examples given by teachers or generated by students with metaphor analysis. Participants of the study consist of 190 preservice mathematics teachers. Data collection tool is included four uncompleted sentences in form: “Visual examples in mathematics are like……, because……” ; “algebraic examples in mathematics are like……, because……”; “Examples given by teacher in mathematics are like……, because……”; “Examples given by students in mathematics are like……, because……”. Participants are asked to complete these sentences. Obtained data were analyzed by using content analysis. To ensure the reliability of the data interviews were conducted with 11 of participants, so classification and thematization of metaphors were checked. In addition, through the interviews in-depth information was obtained on perceptions of preservice teachers with respect to mathematical examples. Abdul-Rahman, S. (2005). Learning with examples and students’ understanding of integration. In A. Rogerson (Ed. ), Proceedings of the Eighth International Conference of Mathematics Education into the 21st Century Project on “Reform, Revolution and Paradigm Shifts in Mathematics Education. Johor Bahru: UTM. Bills, L., Dreyfus, T., Mason, J. Tsamir, P. Watson, A. & Zaslavsky, O. (2006). Example generating in mathematics education, In J. Novotná, H. Moraová, M. Krátká, & N. Stehliková (Eds. ), Proceedings of the 30th Annual Conference of the International Group for the Psychology of Mathematics Education (Vol. 1, pp. 126-154). Prague: Czech Republic. Bullough, R. (1991). Exploring personal teaching metaphors in preservice teacher education. Journal of Teacher Education, 42(1), 43-51. Cerit, Y. (2006). Öğrenci, öğretmen ve yöneticilerin okul kavramıyla ilgili metaforlara ilişkin görüşleri. Kuram ve Uygulamada Eğitim Bilimleri, 6(3), 669-699. Chapman, O. (1997). Metaphors in the teaching of mathematical problem solving. Educational Studies in Mathematics, 32(3), 201-228. Creswell, J.W. (2008). Educational Research planning, conducting, and evaluating qualitative research (3rd Ed.). NJ: Pearson Education. Font, V., Bolite, J., & Acevedo, J. (2010). Metaphors in mathematics classrooms: analyzing the dynamic process of teaching and learning of graph functions. Educational Studies in Mathematics, 75,131–152. Font, V., Godino, J. D., Planas, N. & Acevedo, J. I. (2010). The object metaphor and synecdoche in mathematics classroom discourse. For the Learning of Mathematics, Vol. 30(1), 15-19. Goldenberg, P. & Mason, J. (2008). Shedding light on and with example spaces. Educational Studies in Mathematics 69, 183–194. Ju, M.K. & Kwon, O.N. (2004). Analysis of students’ use of metaphor: The case of an RME-based differential equations course. Journal of the Korea Society of Mathematical Education, 8(1), 19–30. Lakoff, G. & Johnson, M. (2015). Metaforlar, hayat, anlam ve dil. (Çev. Gökhan Yavuz Demir). İstanbul: İthaki Yayınları. (Özgün çalışma, 1980). Leavy, A.M., McSorley, F.A. & Bote, L.A. (2007). An Examination of what metaphor construction reveals about the evolution of preservice teachers’ beliefs about teaching and learning. Teaching and Teacher Education, 23, 1217-1233. Leinhardt, G. (2001). Instructional explanations: A commonplace for teaching and location for contrast. In V. Richardson (Ed.). Handbook of research on teaching (4th ed., pp. 333-357). Washington, DC, USA: American Educational Research Association. Martinez, M., Sauleda, N., & Huber, G. (2001). Metaphors as blueprints of thinking aboutteaching and learning. Teaching and Teacher Education, 17, 965–977. Michener, E. (1978). Understanding mathematics. Cognitive Science, 2, 361–383. Miles, M.B., & Huberman, M. (1994) Qualitative Data Analysis: An expanded sourcebook. (2.baskı)Tousand Oaks, CA: Sage. Moser, K. S. (2000). Metaphor analysis in psychology – method, theory, and fields of application. Forum: Qualitative Social Research, 1(2). Article 21. Peled, I., & Zaslavsky, O. (1997). Counter-examples that (only) prove and counter-examples that (also) explain. FOCUS on Learning Problems in Mathematics, 19(3), 49–61. Saban, A. (2004). Prospective classroom teachers’ metaphorical images of selves and comparing them to those they have of their elementary and cooperating teachers. International Journal of Educational Development, 24, 617–635. Saban, A., Koçbeker, B. N. ve Saban, A. (2006). Öğretmen Adaylarının Öğretmen Kavramına İlişkin Algılarının Metafor Analizi Yoluyla İncelenmesi. Kuram ve Uygulamada Eğitim Bilimleri, 6(2), 461-522. Uygun, T., Gökkurt, B., Usta, N. (2016). Üniversite öğrencilerinin matematik problemine ilişkin algılarının metafor yoluyla analiz edilmesi. 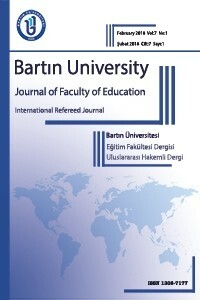 Bartın Üniversitesi Eğitim Fakültesi Dergisi, 5(2), 536 – 556. Watson, A., & Mason, J. (2005). Mathematics as a constructive activity: Learners generating examples. Mahwah, NJ: Erlbaum. support or impede learning. Research in Mathematics Education, 9, 143–155. Zaslavsky, O. (2010). The Explanatory Power of Examples in Mathematics: Challenges for Teaching. In Stein, M. K. and Kucan, L. (Eds.). Instructional Explanations in the Disciplines (pp. 107-128). Springer. Zazkis, R., & Leikin, R. (2008). Exemplifying definitions: A case of a square. Educational Studies in Mathematics, 69(2), 131-148.
of the International Group for the Psychology of Mathematics Education, v.5, pp. 425–432.Thessaloniki, Greece: PME.